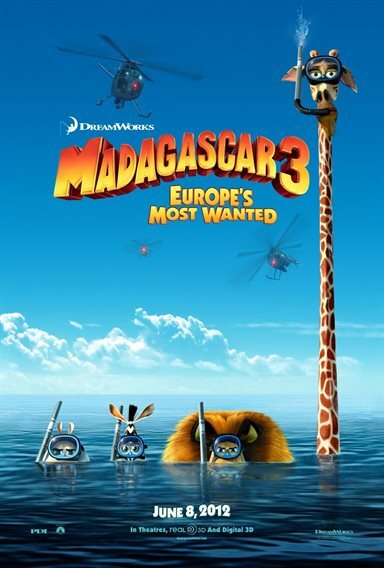 Download Madagascar 3: Europe's Most Wanted in Digital HD from the iTunes store. Madagascar 3: Europe's Most Wanted images are © DreamWorks Animation. All Rights Reserved. 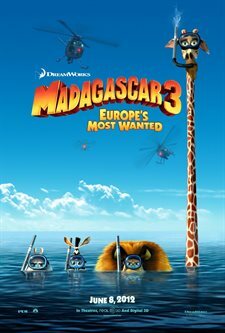 Jumping to the top of the list of my 2012 comedy favorites Madagascar 3: Europe's Most Wanted it's not just for kids. The laughter filled animated adventure tops its two previous films with a very engaging story, excellent 3D and new fun characters. Don't be hesitant to take your family to one of the brightest animated films to come out this year. See it in 3D for maximum enjoyment. This time we find Alex the Lion (Ben Stiller), Marty the Zebra (Chris Rock), Gloria the Hippo (Jada Pinkett Smith) and Melman the Giraffe (David Schwimmer) stranded in the African wilderness after the penguins take off in their only aircraft to Monte Carlo. Realizing that they will never get home to New York unless they track them down, they follow the silly birds. When they get to Monte Carlo however, they find themselves in a pickle and have no choice but to join a Circus. The laughter never stops as the gang gets itself into some very funny situations with Captain Chantel DuBois (Frances McDormand), a French law officer on their heels. The cleaver writers and artists bring this extremely funny character to life as she travels on her moped casing down Alex and his friends. There's enough mayhem in this movie to make a couple of films and that's a good thing. 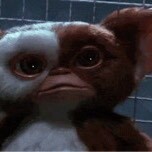 The voice cast really makes the film work, especially that of Chris Rock who takes Marty to a new level of hilarity. He makes his circus debut dressed in a multicolored Afro and clown make-up and he's the hit of the show. Topping Marty's quick delivered one-liners with some inventive dialogue, the script crew makes him the star of Madagascar 3. But, there's no show without the funny group of critters who add to the chaos and madness that continues to entertain big time. The film has been rated PG by the MPAA for some mild action and rude humor so be aware of this for the very young. The 3D is spectacular and the circus scene gets my vote as the best use of the medium in an animated film. The audience attending the Madagascar 3 showing I went to loved it so much they cheered. Madagascar 3 is a ‘great escape' film that will certainly brighten a dull day and create some family fun with or without kids. For adults, it's a chance to release the ‘young at heart' feeling that gets caged up inside from time to time. So if you want to feel like you are a youngster again, take a break from the ordinary.